In 19th century England, Providence’s global reach was attested by its literary output. Yet for many in India, the city’s reach was experienced unknowingly through its chickens. 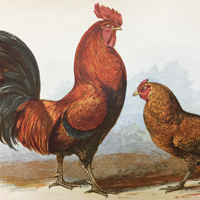 Architectural historian Ijlal Muzaffar will explore how and why the Rhode Island Red was known as the “local chicken” in his great-grandmother’s village in the middle of the Sindh desert in Southwest India (in what now is Pakistan) in 1898. Why, and how did the chicken cross the ocean? Was this simply an accident of history or a trace of a more complicated yet unexplored crosshatching between cities and people, Empires and revolutionaries, on two sides of the ocean? Funded by the Rhode Island Council for the Humanities, the Open Sesame project brings together a diverse group of six artists/scholars working in different genres to research in the Athenaeum’s extensive collections. Ijlal Muzaffar is an Assistant Professor of Modern Architectural History at the Rhode Island School of Design. He has also taught at the Program in History, Theory, and Criticism of Architecture and Art at MIT, where he received his PhD in 2007. He also holds a Master of Architecture degree form Princeton, and a BA in mathematics and physics from the University of Punjab in Lahore, Pakistan. His upcoming book looks at how modern architects and planners play a critical role in shaping the discourse on Third World development and global change.